Prone to Cavities? 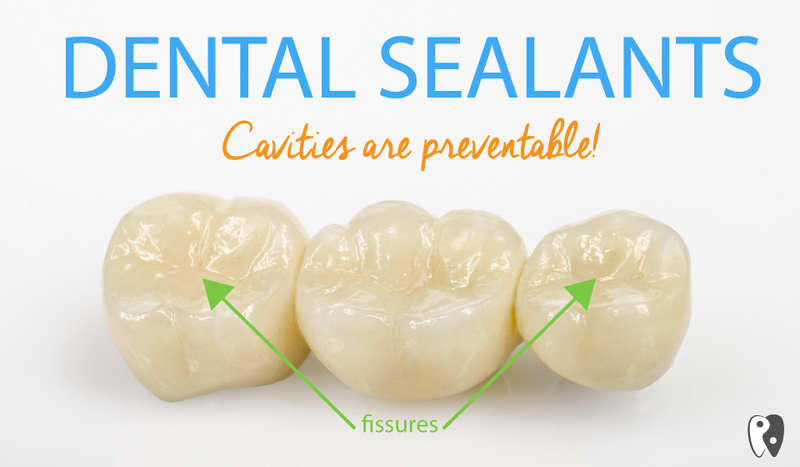 Sealants for Teeth Can Help Protect Your Smile! Sealants for Teeth: What are they? For many outside the realm of professional dentistry, the term sealants for teeth (or dental sealants) might sound unfamiliar; however, as more and more patients are beginning to discover, sealants for teeth are an easy and effective tool in fighting against and ultimately preventing cavities from damaging your teeth. A dental sealant is a thin protective material (often made from plastic) that coats the outer surface of a tooth that protects the tooth from further damage. The purpose of this is to ensure that plaque and excess bacteria cannot build up within the inner edges of your teeth that may prove difficult to clean during regular brushing and flossing. While taking the time to thoroughly bush and floss your teeth is extremely important, sometimes getting all the excess material off of the rough, uneven fissures or crevices of each individual tooth can prove to be quite a chore. To combat this issue, sealants for teeth were created to act as a sort of raincoat for your teeth, essentially shielding your tooth from cavity causing bacteria. Sealants for Teeth: Who are they for? Although dental sealants are used for both children and adults, this mostly depends on the individual patient’s predisposition for cavities, which may be due to both lifestyle circumstances and hereditary reasons. For those who are particularly prone to cavities most dentists, including Dr. Travis Roberts at Adams Dental Group, agree the sooner you can receive your sealants the better. As sealants have been shown to reduce the probability of tooth decay in molars by a resounding 80%! This is particularly prevalent among children as in 2016 Centers for Disease Control (or CDC) released the results of a case study on the overall impact of sealants among children from ages six to eleven. Although only 43% of children in the given age range have sealants, children within this age range without dental sealants typically end up having three times more cavities than those with sealants. We believe this provides an accurate illustration of the effectiveness of dental sealants. Sealants for Teeth: How are they applied? When receiving sealants for teeth, the process is quick and entirely painless. Prior to applying the sealant, Dr. Roberts will typically clean and dry your teeth, to prep them for bonding. The procedure then involves applying a tiny amount of acidic adhesive to the outer grooves of your tooth, in order to create a bond between the tooth and the sealant material. Once applied, Dr. Roberts will harden the bond between the sealant and tooth by using a bright blue curing light, thereby completing the process. Sealants for Teeth: How long do they last? Determining how long your dental sealants will last is difficult as there are always outside variables to consider. Dental sealants can last a range from three to up to ten years if properly maintained. To properly maintain your sealants you most practice regular dental hygiene and remember to schedule and attend your routine six-month dental appointments, so that any necessary repairs can be made. While sealants for teeth remain a new concept for many, their overall effectiveness cannot be denied. If you’ve had cavities in the past, and are concerned about getting any additional tooth decay, ask Dr. Roberts if dental sealants are right for you. Remember a little extra protection can go a long way, so why not protect your teeth? Travis A. Roberts and his experienced, friendly team at Adams Dental Group offer affordable family dentistry and gentle dental care in the Kansas City, KS area. We have two locations that are conveniently located and offer appointment times Monday through Friday to meet your needs. At Adams Dental Group, we provide most dental services, from family and general dentistry to specialty procedures, including dental implants, dentures, endodontic or root canal treatment, professional teeth whitening, cosmetic dentistry and much more. We accept most dental insurance plans and offer affordable financial solutions for any budget. Call us at our East location (913) 621-3113 or at our West location (913) 296-8030 to schedule an appointment.